Jubilee Week: The SNU Library proclaims the week of the Lord’s favor! “The Spirit of the Sovereign Lord is on me, because the Lord has anointed me to proclaim good news to the poor. [the Lord] has sent me to bind up the brokenhearted, to proclaim freedom for the captives and release from darkness for the prisoners, to proclaim the year of the Lord’s favor and the day of vengeance of our God, to comfort all who mourn, and provide for those who grieve in Zion— to bestow on them a crown of beauty instead of ashes, the oil of joy instead of mourning, and a garment of praise instead of a spirit of despair. They will be called oaks of righteousness, a planting of the Lord for the display of [the Lord’s] splendor” (NIV). That ‘year of the Lord’s favor’ Isaiah discusses refers to the year of Jubilee (described in detail in Leviticus). Briefly, this year was characterized by rest, justice and a resetting of ownership – in this year, the land went unplanted, slaves were entitled to their freedom and land/property was returned to its original owner (or heir). In this way, the people of Israel and their political, socia, and economic processes actively recognized that everything in this earth is God’s; they participated in God’s plan of recurring restoration. It is in the spirit of rest, justice and restoration that the SNU Library announces its Week of Jubilee! 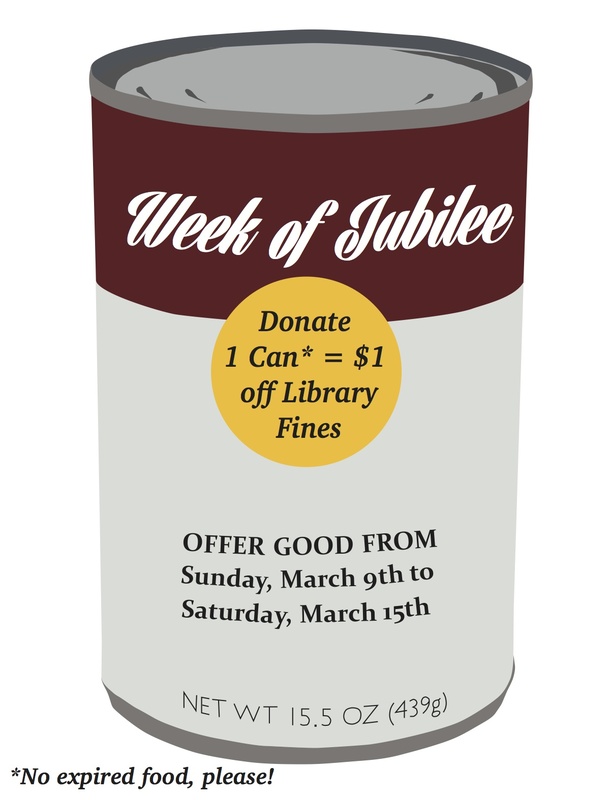 The week of Sunday, March 9 through Saturday, March 15, the Library will celebrate the Week of Jubilee by accepting a (non-expired) canned good item as payment for $1.00 of any fines you may have. So, $1 = 1 canned good. There is no limit to how many cans you can bring in, and any cans you bring over your fine amount will be applied at random to other Library accounts that have fines. The Library will donate all received canned goods to the Regional Food Bank (RFB), and will volunteer with the RFB on Monday of Spring Break (March 17). The SNU Library recognizes that God is the God of infinite information, knowledge and wisdom, servant leadership and humility, relationship-building, flexibility, hospitality, timely assistance and anything else we do here in the Library. We give credit to God for any strengths or abilities we have, as well as anything we’re able to accomplish together, and we hope you’ll join us in that spirit for the week.